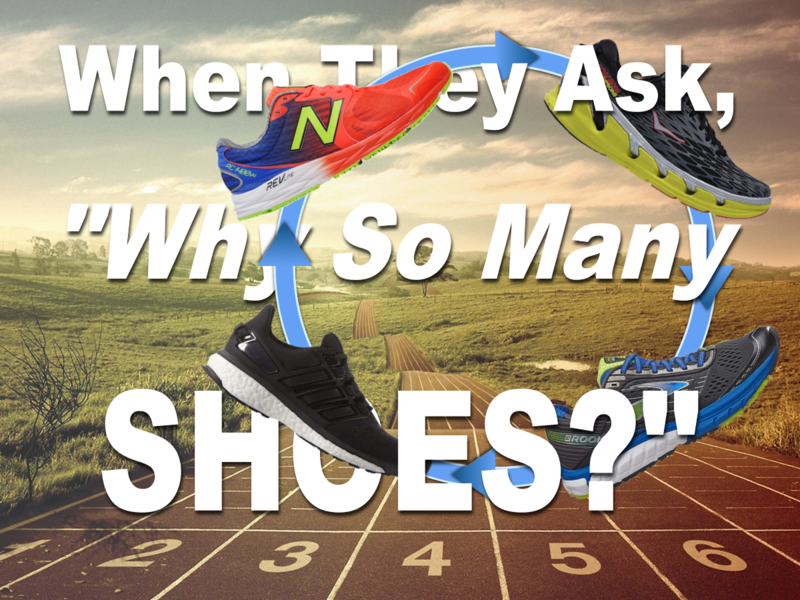 Home › News & Blog › When They Ask, "Why So Many Shoes?" Okay. So, I have a lot of shoes. Some people might say tooooo many, even. Family and significant others used to tease about it to no end. And, in a way, they were right. After all, I’ve got shoes for everything: Long runs, recovery runs, tempo runs, track workouts, racing flats, rainy day shoes, barefoot protection shoes, dry trail shoes, muddy trail shoes, and racing trail shoes. In some cases, I even have two pair for each purpose. I’m aware that many people may view it as a little excessive. But if you ask me, I think I’m on to something. Something that might help give you an edge and - at the very least - keep injuries at bay as your mileage ramps up over the warmer months, carving out a faster, fitter you! I’ll admit, one reason to have multiple pairs of shoes is mental - no pun intended. While ratios vary, depending on which “authority" you ask, most people will agree that our sport is half physical and half mental. … or is it 50% physical, 90% mental? Regardless, considering that roughly half of your success comes down to what is in your head, wouldn’t you like a shortcut to entering that right frame of mind? For example, when it’s time to take it easy and move along as relaxed as possible, simply putting on a pair of soft, highly cushioned shoes is all that it takes to remind myself not to push it. In fact, as hard as I try, in some shoes, it’s as though I’ve been hypnotized. I simply can’t get up to speed. Likewise, when the day calls for some harder work, be it a tempo run or intervals on a track, it doesn’t matter how sluggish my body feels, before I get dressed. The moment my “speed” shoes are laced and split shorts are on, everything changes. I feel transformed. From Eeyore to Speedy Gonzales… strangely, neither of which wear shoes. If you’ve ever laid out what you plan to wear for a race, the night before or have a special outfit, bracelet, hat, lucky water bottle, or socks, etc., you know the feeling. And while it may all be mental… that is half the battle. You don’t need to be in training mode, chasing down a PR, to benefit from tossing an extra pair of shoes into the mix. Truth is, the BIGGEST benefit you can get from having more than one pair of running shoes isn’t for performance at all. When I first started running, I was convinced that the activity might not be for me. Heck, for the first year or so, I didn’t go more than a two week stretch without suffering from one ailment or another. IT Band issues, Achilles tendonitis, patella tendonitis, pes anserine tendinitis, plantar fasciitis, baker’s cysts, hip pain, back pain, shin splints, you name it, I’ve had it - again and again. And the moment one issue finally went away, another would pop up. Cleared up IT Band problems with my left leg, they show up in my right a day later. Sometimes I wondered how or why I kept torturing myself. Now, I won’t dive into the debate of the cushioning of a shoe “having time to decompress” after running in it. What I will say is that every pair of shoes is made - at the very least - a little bit different. Those slight (and sometimes major) differences activate the muscles in your feet and how they fire just uniquely enough to keep your body from landing on the same bones, in the same way, day after day. Enough, perhaps, to keep you off the sidelines with injury after injury and out on your runs, day after day. So, whether you’re looking to add a special mental edge to your training or just trying to keep those nagging injuries at bay, a second pair of kicks will go a long way!